Emanuel Gottlieb Leutze’s most famous painting, at least in America, is Washington Crossing the Delaware, painted in 1851. It hangs in the Metropolitan Museum of Art, which is where I first got to know it, through the best medium available to a child: Sesame Street. In 1983, PBS premiered the one-hour special, Don’t Eat the Pictures, in which the gang gets stuck overnight in the Met. I had the VHS tape all through childhood. Along with a number of awesome songs (Grover sings about friendship to a suit of armor! Oscar sings about the beauty of broken statues! ), there’s a great bit between Bert and Ernie as they examine Leutze’s romanticized depiction of the Revolutionary War commander. Ernie wonders aloud why Washington didn’t just wait until spring to cross the icy river, and when Bert replies that the British were coming (or going?) to New Jersey, asks why they just didn’t take the George Washington bridge. It took me, a kid growing up in semi-rural Vermont, decades to understand the joke. Anyway, many of Letuze’s paintings showcase American patriotism, for better or worse. His arrival in Europe in 1842, happened to coincide with a period of revolutionary upheaval across the continent, which culminated in 1848. Letuze wanted his art to inspire the masses that were hungry for change. In retrospect, they fall a little short: aside from his depictions of events of the revolutionary war, Leutze’s paintings celebrated and commemorated things like Manifest Destiny and the conquest of Tenochtitlan by Cortez. Leutze’s historical paintings reflect the ideals of the academies of European art: heavily romanticized, sanitized, almost folkloric. If there is blood, it’s discreet and divorced from any visible wound. If there’s death, it’s heroic or grievously tragic, arms outstretched and eyes cast towards the heavens. These characteristics are on display in his painting Game as well, which depicts a pyramid of freshly killed animals, so artfully positioned that it could be a centerpiece in a Martha Stewart holiday arrangement. All the animals looks like they just fell asleep cuddling each other in a big puppy pile. There’s very little evidence of actual death in the painting, despite that its subject is a stack of fresh animal corpses. In Don’t Eat The Pictures, the title song is performed (unsurprisingly) by Cookie Monster. “ME EAT PICTURE,” he decides, and lunges for Still Life With Apples and Pears by Cezanne. He’s barely held back by Bob, who points at a sign just off screen. “Please don’t eat the pictures,” it calmly requests. Like Cezanne’s painting, many of the still lifes by Raphaelle look good enough to eat. Peale came from an intellectual family that was devoted to the arts: he had brothers named Titian and Rembrandt (successful artists in their own right), and his father founded the now-closed Peale Museum in Baltimore. Peale had ill health in the latter half of his life. While many of his contemporaries were painting glorious landscapes, portraits, or romanticized historical events, Peale chose, from 1810, to concentrate almost solely on painting still lifes. He was one of the first artists in America to do so, ignoring the academic ideals of so-called “high art,” which considered still lifes amateurish. His still lifes provides an unwitting window into American agriculture and trade, with his sumptuous paintings of American-grown fruits on display in imported glass bowls and china (examples of which are also on display at the Art Institute’s exhibit). 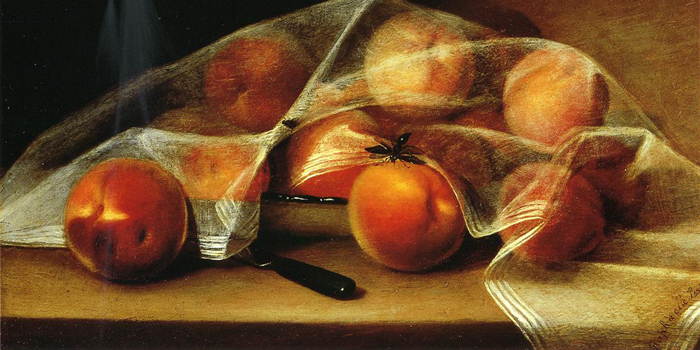 I particularly liked Covered Peaches, which seems like the polar opposite to Leutze’s Game. Not just for its subject matter, though I’ll always take a box of peaches over a heap of animals that look like they just died from carbon monoxide poisoning. Covered Peaches has a warmth to it, a sense of vitality and delicacy. Nature intrudes on the frame, as evidenced by the wasp and housefly and the bruised fruit. The painting is grounded in a way that Game is not, in a way that was probably daring for its time.